Signed Photograph of the Fred M. Vinson Court, circa 1949/1953, including Chief Justice Fred M. Vinson, Felix Frankfurter, Hugo L. Black, Stanley Reed, William O. Douglass, Tom C. Clark, Robert H. Jackson, Harold Burton, and Sherman Minton. The black and white photograph measures 13 1/8 inches wide by 10 1/4 inches high. Signed on the mount below. Overall dimensions: 15 1/8 inches wide by 13 1/4 inches high. 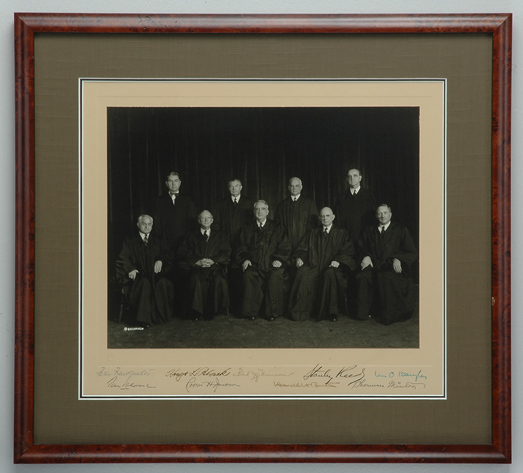 The “Vinson Court” Supreme Court served from 1946 to 1953, a relatively short period of time. Its term coincided with the House Un-American Activities investigation of the movie industry and the subsequent blacklisting of many notable writers, the witch hunts of Senator Joe McCarthy, and a nation-wide fear of Communists. The Supreme Court wrestled with labor unions (United States v. United Mine Workers), communism (dealing with the conviction of the Rosenbergs), loyalty oaths, and racial segregation. The sudden and unexpected death of Chief Justice Vinson sent Brown v. Board of Education to the court which followed, the Warren Court. Framed, with a taupe mat and brown wood frame, dimensions: 21 inches wide by 19 inches high.